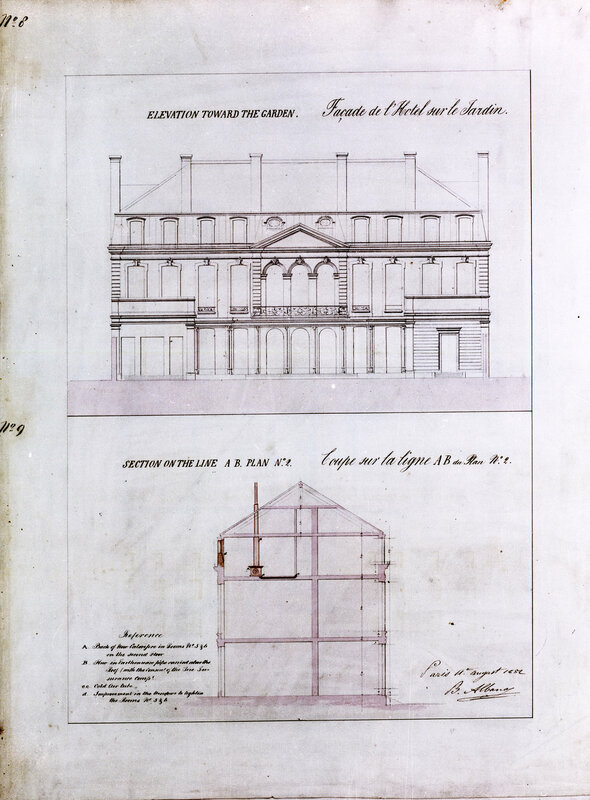 With the purchase of 39 rue du Faubourg Saint Honoré in 1814 as the British ambassador’s residence, HM Treasury became responsible for ensuring that the building was properly maintained by the embassy. Although the fabric of the house has hardly been changed over the last 200 years (unlike its two pavilions), the interiors of the main rooms have been often and variously changed, with different degrees of necessity and skill, to reflect changed times and tastes. Many published histories of the house tend to chronicle the ambassadorial, decorative and furnishings aspects of these changes. The following pages concentrate instead on the major refurbishment programmes that have been carried out over the last 200 years. It is worthwhile prefacing this overview with the names by which each room was known in Pauline’s time and today. (The numbers in the key below refer to the diagram in Part 1.) Some of the (many) intermediate names are also given. A few years after the acquisition of the house, the Treasury commissioned the architect L. E. A. Damesme for advice on its upkep: after his death in 1822, his partner, Joseph Bonnerie, took over. Their main preoccupation was extensive propping to cope with the subsidence of the vaults and cracking of the south wall of the house caused by the two large and inadequately supported openings that Bénard had made ten years earlier for the dining room and picture gallery (by then re-named the ballroom). During this same period, the remaining horses, carriages and stable hands were transferred from the west pavilion to the stables in Rue d’Anjou and that pavilion was converted into a house for the secretary of the embassy. Soon afterwards, in 1824, the Treasury turned to the Office of Works for advice on the extent of further restoration work necessary. The Office responded by asking Robert Smirke to visit Paris and report on the state of the house. He found that there was a considerable maintenance backlog and he particularly warned that work was urgently required on the two wings. This work was approved by the Treasury but, before it could be carried out, Lord Granville succeeded Sir Charles Stuart as ambassador and was much more concerned about what he saw as deficiencies in the furnishing of the house, to which ‘it does not appear that the attention of Mr. Smirke has been particularly called.’ Granville therefore asked for another visitor to come and advise on putting ‘the hotel in a condition fit for the residence of His Majesty’s Ambassador’. Lewis Wyatt, a nephew of James Wyatt and a clerk of works in the Office of Works, was accordingly sent to Paris in early 1825. He concluded that about £25,000 would be required to restore the house and stables, repair and replace furniture, and build the chapel that the ambassador had requested at the end of the garden. The Treasury was aghast and resolved to sell the house straightaway. Granville dissuaded it from that course by rubbishing the estimate and pointing out, in any event, that renting a suitable alternative house would be much more expensive. The Treasury relented but limited expenditure to £12,000 for the house and furniture and forbade the chapel. Louis Tullius Joachim Visconti, later the designer of the Nouveau Louvre, was appointed as architect and the virtual rebuilding of Pauline’s two wings went ahead. Visconti also added a glazed gallery running alongside both wings and linking them across the garden front of the house. This was a masterstroke that solved a serious circulation problem during large entertainments and has been applauded by occupants, though rued by purists, ever since. Visconti also restored and redecorated other parts of the house, repaved the cour d’honneur, added a semi-circular iron and glass marquise over the entrance steps, and introduced gas into the pavilions. The outturn cost, unsurprisingly, was about 50 per cent more than the Treasury had stipulated. Granville and Visconti both apologised and the Treasury accepted Granville’s later offer to pay £1,500 himself for some of the furniture. Chastened by the costs of the house, the Treasury posted the Hon. Frederick Byng to Paris in 1830 to keep a tight rein on expenditure and supervise the accounts. With the appointment the following year of a new local architect, I Silveyra, to carry out regular inspections and supervise all repair works, it looked as though effective management might be in place. But in 1835, Granville, at the start of his third incumbency as ambassador, called for an estimate of the cost ‘for rescuing the interior of the hotel from its present degraded state’. Silveyra reported that the building fabric was mainly in adequate condition but the bitumen with which the wings had been roofed only ten years earlier should be replaced, and a further £1,000 needed to be spent on the interiors. This time it was the Foreign Secretary, Lord Palmerston, who decided that the embassy house should be sold: over £30,000 had been spent on repairs since it was bought twenty years earlier. Granville again successfully contested this conclusion and Palmerston reluctantly authorised £2,500, a third of which was for roofing the wings in copper (which he insisted be bought in England). In 1836, therefore, Sylveyra began a two year programme, including re-roofing the garden wings with copper, extensive rebuilding of the kitchens, re-laying of drains, installing a fountain on the terrace, and more internal furnishings. The outturn cost in 1839 was once more about 50 per cent greater than the authorisation. Granville’s apologies and explanations this time failed to carry conviction. The Treasury proposed to the Office of Works that it should, as an experiment, take over direct responsibility for the Paris house. The commissioners agreed on condition that the same arrangements would apply in Paris as already governed their management of public buildings in England. This meant that all works should be properly estimated and requisitioned, all accounts should be rendered quarterly, no exceedings entertained unless pre-agreed, and an English architect should make periodic inspections. The Treasury and Palmerston readily agreed to this stern regime. Granville, in his fifteenth year as ambassador, and correctly assuming that fault was being imputed to him, agreed grudgingly. The Office of Works asked the architect Decimus Burton, whom it regarded highly for his reliability and professionalism, to report. He first visited Paris in June 1840 and his findings were thorough but not dramatic. 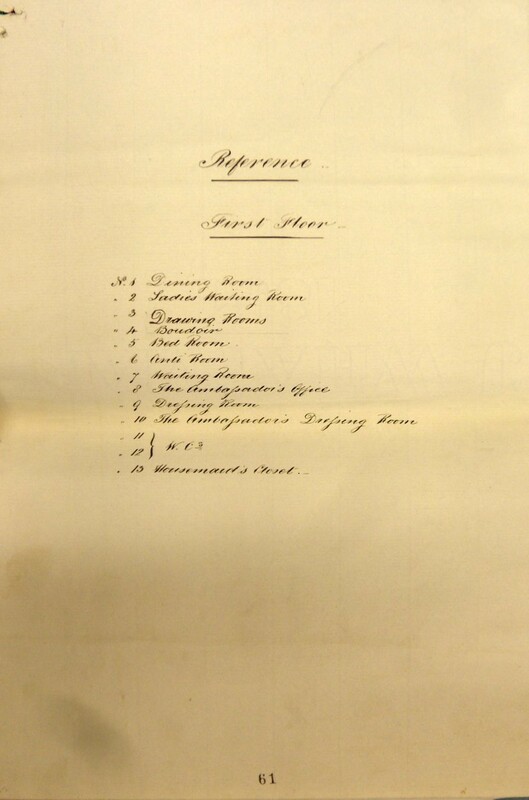 He had found no plans of the house, so had made nine drawings of his own; he thought a new inventory was needed, not least to distinguish between items owned by the government and by the ambassador. Palmerston pressed for Burton’s recommendations to be put into effect but, before they could be acted upon, Granville was succeeded in late 1841 by Lord Cowley, brother of the Duke of Wellington, who considered the house to be in such bad condition ‘that it was impossible to live in it’. Cowley and Burton accordingly adjusted the programme to suit Cowley’s revised priorities and the next ten years saw a relatively stable managerial routine. 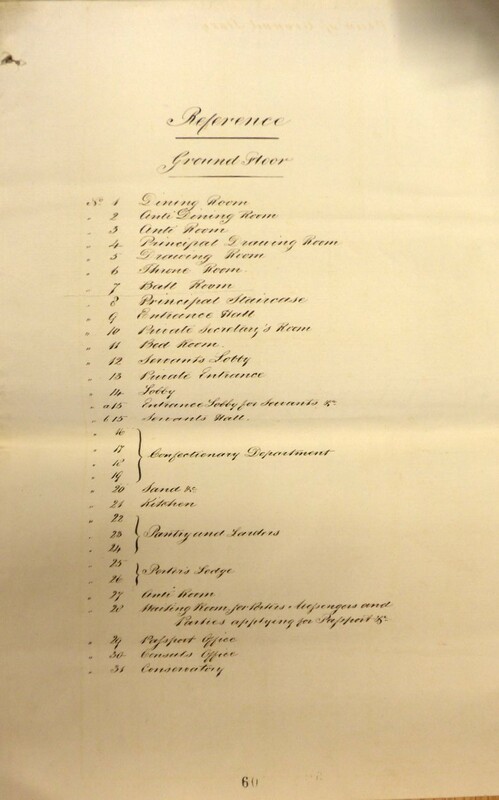 Burton, as supervising architect, made annual inspections, reporting to the Office of Works commissioners after each visit and providing them with an estimate of the costs of repairs which it would be sensible to carry out during the following year. Silveyra prepared and oversaw the contract work. During this period, the main building was re-roofed in 1841; the west pavilion, which by then housed the chancery and passport offices, was extensively repaired; a new throne was provided in 1842; and the cour d’honneur was repaved again in 1851. Burton was unceremoniously discharged in 1851 when Jacques Ignace Hittorff, a busy and respected Parisian architect, was asked by the ambassador to redecorate the ball and throne rooms. At the same time, Hittorf inserted three glazed doors into the, hitherto blank, south end of the ballroom. The tendency for successive ambassadorial views to oscillate resumed after Burton’s departure from the scene. The Marquess of Normanby, who succeeded Cowley, moved the chapel from the state dining room to the ballroom, only to be succeeded in 1852 by Cowley’s son, who argued the case for returning the chapel to the dining room on the grounds that it was more seemly for worship to share space with eating than dancing. More fundamentally, however, the younger Cowley found huge fault with the house and prompted the Foreign Secretary, fleetingly the earl of Malmesbury, to tell the Office of Works that he knew from his own inspection of the house that ‘the present state of the Embassy is so indecently dirty as to render it unfit to be inhabited by Her Majesty’s Ambassador, and, in truth, reflects but little credit on the British nation; and that it is important that no time should be lost in remedying this evil’. The Office of Works was nonplussed. The first commissioner, Lord John Manners, suggested that Benedict Albano, a London architect who had proved his worth to the Office of Works at Madrid, should visit Paris straightaway to survey and report. Albano put in hand another programme of repairs, mainly to the interiors and furnishings, and produced a new set of record plans. Under his direction, also, two ground floor ante-rooms and the stairhall were combined. Albano discharged Silveyra and the upholsterer, Isouard, and remained in Paris himself as resident architect for the next two years, during which the interiors of the house moved another step away from clean Empire towards enriched Victorian, a process of which Queen Victoria approved when she visited the house in August 1855, telling her diary that ‘it is very pretty indeed, and newly furnished’. Albano also replaced oil lamps with gas burners throughout the circulation areas and stairs of the house. The Albano appointment went sour in due course and Parliament became indignant. Once that had quietened down, Henry Hunt visited in 1856 from the Office of Works and concluded that much still needed to be done. He was not believed and so a French architect, Etienne Raveau, was commissioned for a new report in 1857. Raveau vindicated Hunt’s conclusions and was asked to plan the necessary works, assisted by a George Buckler from the Office of Works. The scope of their programme was wide. The skylights in the servants’ attic bedrooms were replaced with dormers; the secondary service stair was extended to the ground floor and the small dining room there converted to a service kitchen; windows were inserted in the south end of the dining room, as Hittorff had done in the ballroom; macadam was laid in the central court; the west arcade screening the stable court from the cour d’honneur was demolished; the west pavilion was partially rebuilt again to house some chancery offices; the marquise was extended laterally across the house; the pediments were filled, with Victoria’s coat of arms on the garden side and three putti in a boat on the front; a small iron and glass conservatory was built on to the dining room roof; the floors of the ballroom and dining room were renewed; and electric bells and speaking tubes installed. This extensive work, supervised throughout by Raveau, was substantially complete by the end of 1859, but some items dragged on, notably plasterwork in the ballroom, until 1864. The rest of the nineteenth century saw relatively few changes. During the Communard uprising in 1871, six shells fell on the roof knocking down a chimney and shattering tiles and glass, and the pavilions’ walls to rue du Faubourg St Honoré were damaged by gunshot. The services were gradually updated: improved: new sewage pipes were laid during the 1880s, electricity was installed in 1896, and central heating was installed in 1901. The rooms were being ever more burdened with Victorian clutter and imperial trophies, culminating in 1887-96 under two successive ex-vice-regal ambassadors, the Earl of Lytton and the Marquis of Dufferin and Ava. The tide began to turn in 1896 when C. L. Veale from the Office of Works visited and drew attention to the buried Empire inheritance. It was King Edward VII’s state visit to Paris in May 1903 that prompted the next overhaul. He was both intrigued and dismayed by the house, and took a personal interest in the 1905 redecoration, which was overseen from London by Sir Henry Tanner, principal architect and surveyor of the Office of Works. Arthur Vye Parminter, an English architect living in Paris, was the resident architect and Georges Hoentschel, a connoisseur friend of the new ambassador, Lord Bertie, was called upon for advice. The intention was that the interior of the house should return to a simpler and cleaner style so as better to reflect the Entente Cordiale. At the same time, the roof was reinforced with steel girders; the wings in the garden were refaced; the fountain was removed from the terrace; many of the rooms, as well as the stairhall, were restored; and the conservatory on the dining room roof was removed. A new lightness and brightness suffused the house, which pleased King Edward on his next visit in 1907. In 1909 the west pavilion was remodelled to upgrade the chancery and its other offices, and its external stucco replaced with ashlar facing. For the duration of this work, the offices were decanted into the ground floor of the main house, with the throne room housing the telephone exchange. 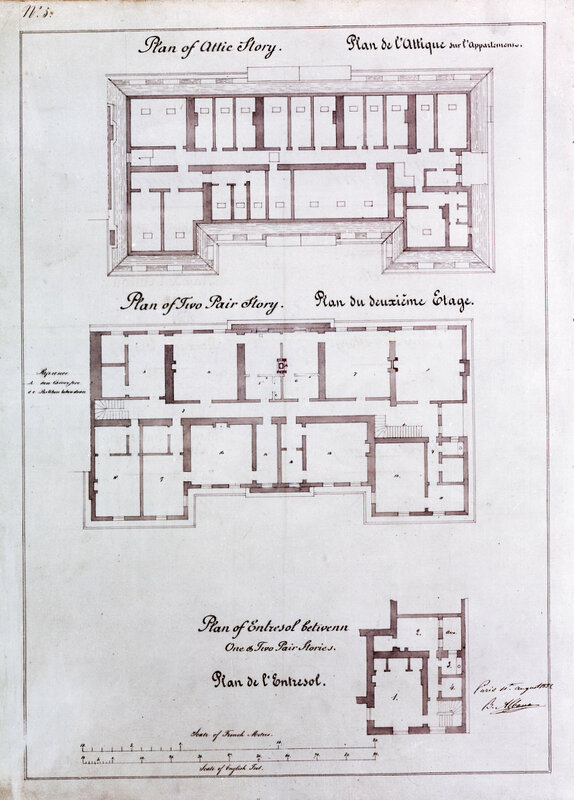 Concurrently, the kitchen and its ancillaries were moved out of the east pavilion and into a new building occupying all of what was originally the kitchen court and incorporating the east arcade as the new kitchen’s front wall. Tanner, an advocate and innovator of reinforced concrete framing, saw to it that ferro-concrete beams were incorporated in this structure. The vacated east pavilion was remodelled into domestic staff quarters. In 1911, bus services commenced along the street and the vibrations raised fears for the house’s structural stability. Allison inspected in 1912 and found that many structural timbers in the house were defective: numerous floor joists were replaced and some steel joists inserted the following year. Embassy staff remained in Paris throughout the First World War, although the house’s valuables were sent to London for safe-keeping in 1918. There were no significant changes to the house between the two World Wars, except that it was thoroughly rewired, the telephone installation was renewed in 1932 and the heating in 1935. The retained local architect for most of this period was a M. Chatenay. When war threatened again, the house’s valuables were sent to Chambord for safe-keeping. All the embassy staff left Paris in June 1940, and the house, with staff and others’ possessions and furniture stacked high throughout the ground floor rooms, was left in the care of two local British staff and their wives, under the umbrella of America as protecting power. 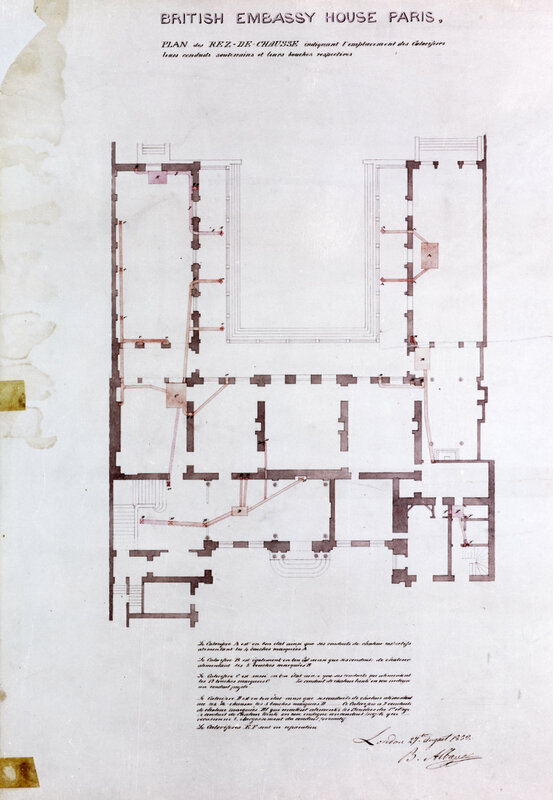 1852 ground floor plan by Benedict Albano showing, in particular, proposals for restoring the dining room to chapel use. The ambassador was to have a private family pew carved out of the Salon Jaune. Albano’s key to ground floor plan above. 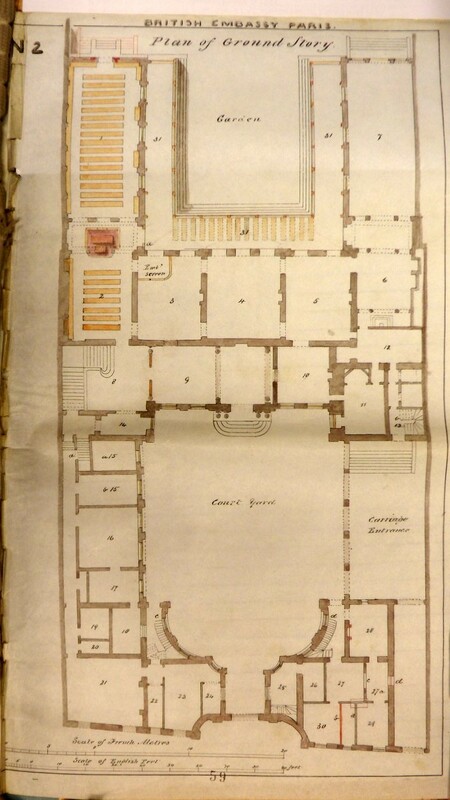 Albano’s entresol (mezzanine) plan, 1852. 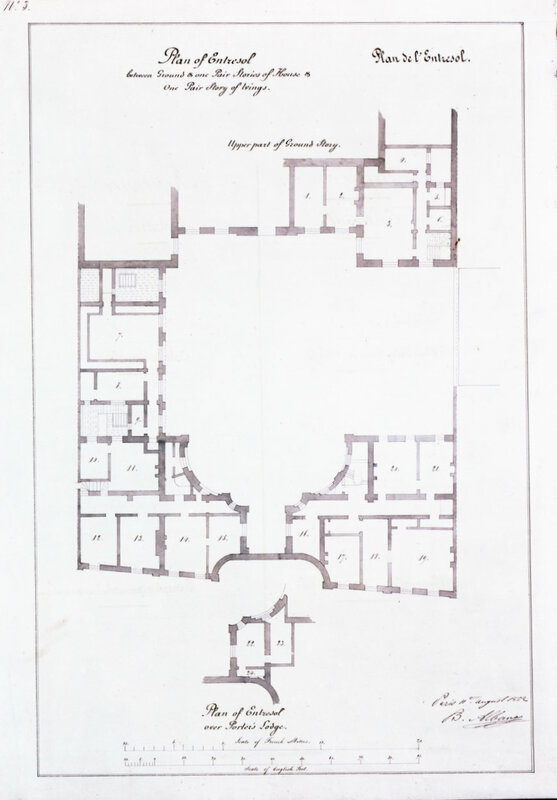 Albano’s first floor plan, 1852. Albano’s key to first floor plan above. 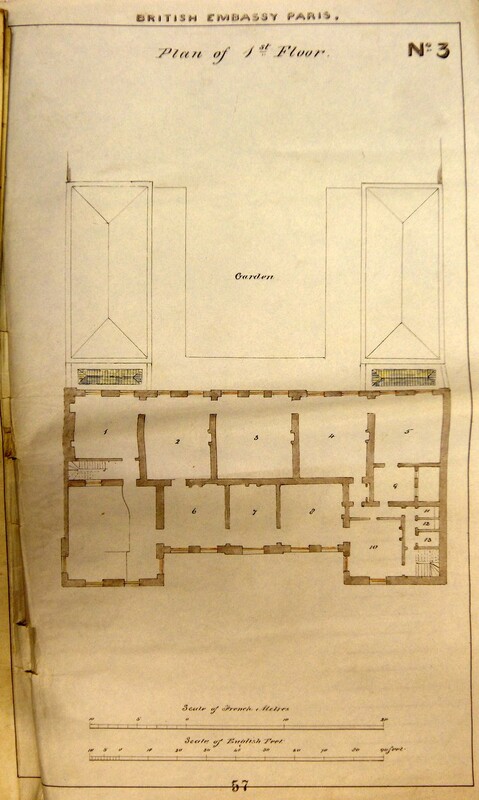 Albano’s plans of second and attic floors, 1852. Albano’s drawing of south, garden elevation, and a section, 1852.